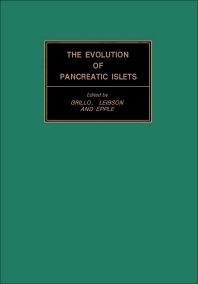 The Evolution of Pancreatic Islets covers the proceedings of the 1975 symposium on The Evolution of Pancreatic Islets, held at Leningrad under the auspices of the Academy of Sciences in Leningrad, U.S.S.R. This symposium brings together numerous studies on the structure, chemistry, and function of the pancreatic islets of animals ranging from the mollusc to man. This book is composed of three parts encompassing twenty seven chapters. The first part deals with the problems related to the production of insulin from its precursor pro-insulin and the ontogeny of the pancreatic islets from the embryonic endoderm. The second part discusses the phylogenetic aspects of the structure of pancreatic islets. This part also looks into the evolutionary morphology and classification of pancreatic acinar-islet cells. The third part describes the biological and chemical aspects of pancreatic hormones of vertebrates.